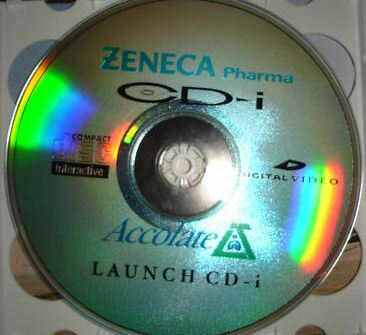 -New copies of the relevant CD-I titles (see below for description for this kit). 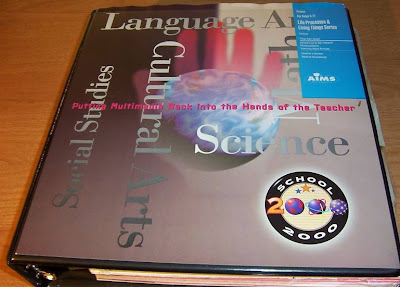 -A section dedicated to teacher guide materials, explaining how best to use the materials to teach the subject, including proposed lesson plans. 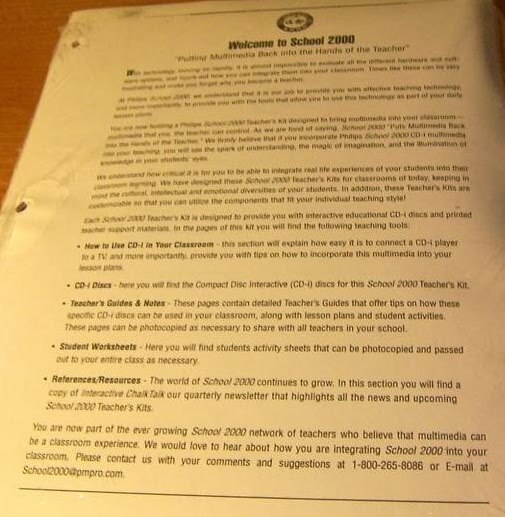 -A section of student materials (designed to be photocopied) providing exercises to reinforce the lessons learnt. Millions of dollars were invested in the School 2000 series which is still current today ? these kits allow you to turn your CD-I machine into a home schooling system. All sets include a teacher's guide and student worksheets. Also includes case and binder. 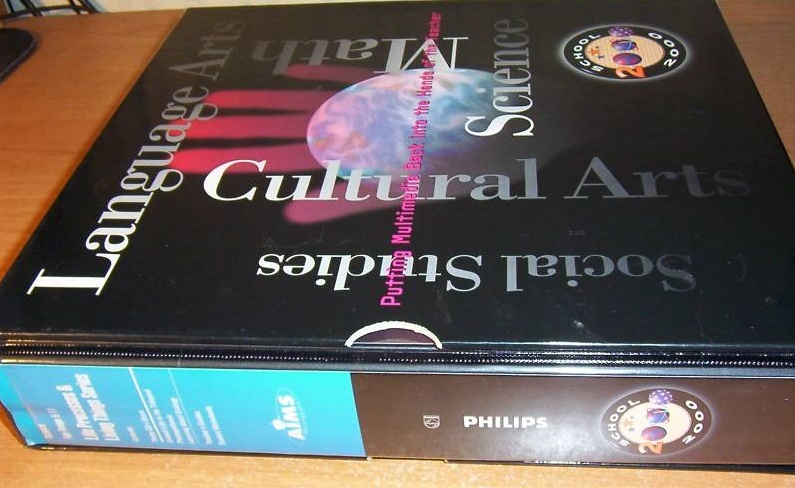 It's pretty amazing Philips released more than twenty teacher's kits like this, ranging from Language Arts to Science. Among the latest Teacher's Kits are four additions to the School 2000 Language Arts category: The Chronicles of Narnia(TM) - 9 Discs - $129.99 Based on the acclaimed BBC production of C.S. Lewis' children's classics, The Chronicles of Narnia discs take students into a magical world where animals speak, mythical creatures roam the land and four children fight an epic battle. That sounds like a very interesting education, who have ever seen these? Prepare yourself for hours of fun and facial mayhem with Caricature. With a few simple clicks on the CD-I controller you can distort, disfigure or improve some very famous faces from a library of over 100 photos on this disc. Included amongst these are royalty, politicians, sportsmen and women, and celebrities. As an added bonus, some photographs hold a short video clip of your chosen personalities as realised by Spitting Image. Even better, by using a Photo CD disc, you can create caricatures of your own family, friends, enemies or pets. With the help of Spitting Image, you can explore the realms of caricature from its 18th century origins through to the present day. 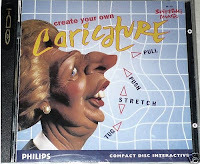 Learn the background behind Spitting Image and acquire some tips on the techniques of caricaturing, followed by a demonstration. With this dics anyone can create expert caricatures - of almost anyone else - in next to no time at all. Looking for a game with a difference on Philips cd-i? Well you've found it. 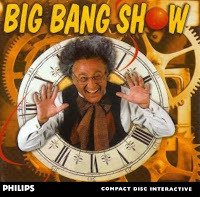 Big Bang Show combines arcade action with puzzle solving, and even an optional quiz if you get stuck! The object of the game is to guide Sparky, a ball of energy, around a series of 100 game screens (like mazes). You must avoid obstacles, use objects which you collect (for example, water droplets to put out fires) and also your strategy to find the goal at the end of each level which allows you to progress. There are several options to the game... you can have full commentary from Professor Albertus (the creator of Sparky), a fast or slow moving game, quiz on/off and you can save your progress continuously. After you've completed a series of screens, you move either forwards or backwards in time. During the game you visit five different ages.. 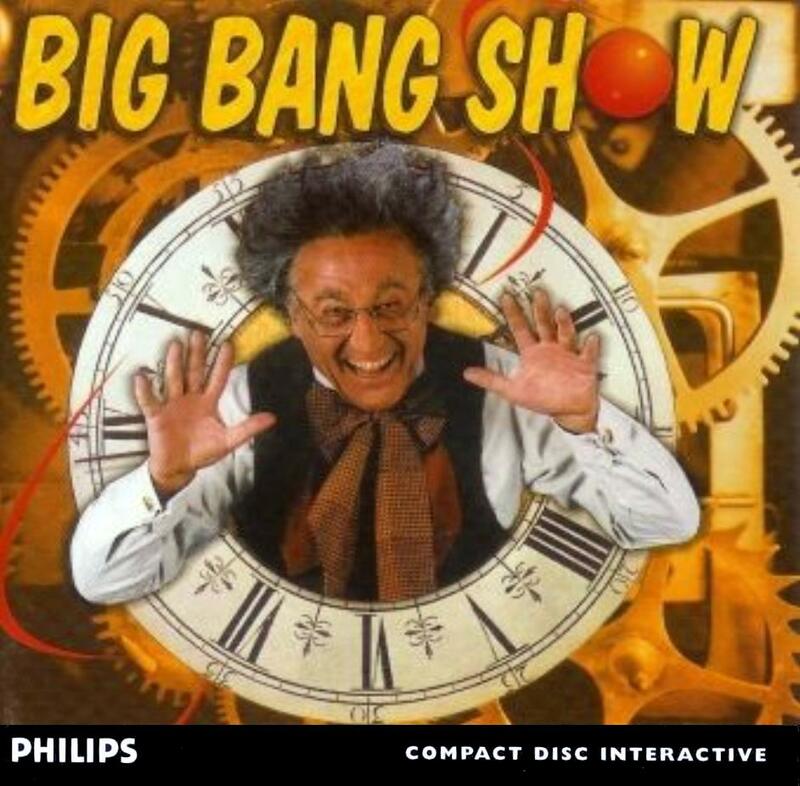 The Big Bang, Prehistoric times, The Middle Ages, The 20th Century and the future. Your enemies and objects to collect therefore vary in appearance considerably! There are some points in the game where you find yourself in an impossible situation. This is where the quiz can help. If you set this to ''on'', you can try and answer a question on the various ages which, if correct, will get you out of the hole. You can also choose to have a 1 or 2 player game, although this is not split screen. The instructions are complete and in both English and French. The game can either be played in English or French. A digital video cartridge is not required. The game will play on all Philips cd-i players worldwide. Black Moon updates the frontpage with a news paper article about the way how Philips promoted Burn:Cycle in a true online internet campaign. For being a (september) 1994 game, this must be some kind of pioneer for getting its own website at burncycle.com - a website even too old for the Internet Archive to retrieve! Read the full article here. I always wonder if this marketing was one of the reasons that the CD-i version of Burn:Cycle has been viewed as one of the most prominent titles on its system, with Electronic Gaming Monthly awarding it "Best CD-i Game of 1994", and GamePro calling it "just what the CD-i needed". The magazines lauded the game's audio and cinematics. GamePro gave it a 5/5 score for three categories (graphics, sound, and fun factor), rating control at 4.5. 1UP.com, impressed by its futuristic setting and storyline, referred to Burn:Cycle as "one of the best showcases of the console's strengths." 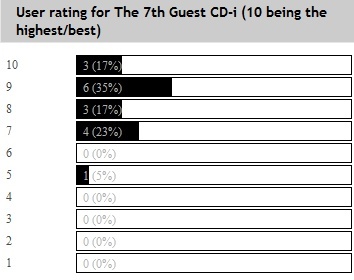 The 7th Guest was rated with a 8,3 in total (10 being the highest/best). Search the site to find more info on the game. From today, we start with Accelerator, the SPC Vision racing game from 1997.